Condition is Used. Light discoloring on top of projector - does not affect performance. Works good. DOES NOT INCLUDE REMOTE. Vivitek Qumi Q6 LED Projector. Condition is Used Like New. All accessories included. Shipped with USPS Priority Mail. 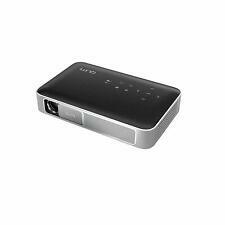 Vivitek - Qumi Q38 1080p Wireless Smart DLP Projector basically brand new, plastic has not been removed. 0 hours on the LED. Includes all original accessories. Fast shipping! Qumi Q38 is a powerful bright pocket size projector with integrated battery, Wi-Fi and Bluetooth to make it easy to instantly switch on and enjoy a 130’’ diagonal screen anywhere you want. With the integrated battery, you will always be able to project even in the most unusual places. Versatile and portable, the Vivitek Qumi Q5 is perfect for sharing digital content at work and play. Screen and Case included. Lots of dongles. Estimated 30,000 hours of operation. 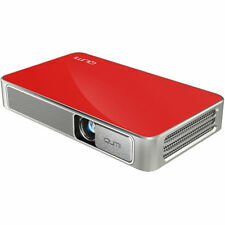 Vivitek Qumi Q3 Plus 500 Lumen Ultra HD Pocket DLP Projector with Wi-Fi Red 1YR Condition is Manufacturer refurbished. Shipped with USPS Priority Mail. Vivitek Qumi Q2-LITE B Q2-LB WXGA HDMI 3D-Ready HD 720p. Model: Qumi Q2-LITE B Q2-LB. Pocket DLP Projector. Wired Projector. Item Details. Red Vivitek Qumi Q5 LED Projector with Extended Battery Pack (2 hours). All original box, packaging, case and remote. Vivitek Qumi Q5 500 Lumen WXGA HD 720p HDMI 3D- Ready pocket DLP Projector with 4GB Memory- color is RED. Comes with AV in cable, HDMI to HDMI Cable, 24 pin VGA Cable, Power cord, Remote Control, quick start guide, Document kit and Qumi case to put it all in. BRAND NEW IN BOX, NEVER USED. The Vivitek Qumi Q3 Plus gives you a number of popular connections, including an 1/8" A/V, HDMI, a microSD slot, and two USB ports. At only 1 lb, it's easy to transport, and the built-in speakers allow you to hear the audio without the need for an external speaker system. As their ubiquity increases, so does the need to easily, instantly, and precisely share what s displayed on their screens with one's peers. DC-in, Audio-Out, USB-Input, HDMI, and MHL. Wireless content sharing from Android and iOS devices. Condition is Used. This Projector is used and in great condition and has been tested and works great. Qumi Q3 Plus is a powerful bright pocket size projector with integrated battery, Wi-Fi and Bluetooth to make it easy to instantly switch on and enjoy a 2.6m/100” diagonal screen anywhere you want. The embedded Wi-Fi allows connect and project without cable hassle just switch it on and mirror the phone screen! Versatile and portable, the Vivitek Qumi Q6 is perfect for sharing digital content at work and play. Bought the item for a presentation nd ended up having to just use a regular projector. Make sure the entire audience can see your presentation with this portable Vivitek wireless projector. Series: Qumi. DLP image technology. 1080p (1920 x 1080) native resolution. Including 480p, 720p, 1080i, 1080p and 480i for a wide range of compatibility options. NEW IN THE FACTORY SEALED BOX. With a variety of inputs including HDMI, Universal I/O, and USB, connecting any device to the Qumi Q5 is as simple as plug and play. Condition is New. InterfacesVideo inputHDMI x 1. Technical FeaturesAudio Output3.5 mm Mini Jack. 3-D ready via DLP link and wireless capability through an optional WiFi USB dongle. Native HD 720p resolution. This Projector is used and in great condition and has been tested and works great. Power cord. Wireless content sharing from Android and iOS devices. No cables needed, your device is enough. Wireless mirroring enables users to share exactly what they see on their device with an entire classroom or conference room. Versatile and portable, the Vivitek Qumi Q5 is perfect for sharing digital content at work and play. Manufacturer: Vivitek. Native HD 720p resolution. HDMI Cable. Carrying Pouch. Power Cord. 3.5mm AV-in Cable. Wireless content sharing from Android and iOS devices. Native Auflösung des Projektors WXGA (1280x800). Projektionstechnologie DLP. Benutzerhandbuch Ja. Betriebsanleitung Ja. Schnellstartübersicht Ja. Fernbedienung Ja. Höhe 34 mm. Tiefe 102,4 mm. Projektionstechnologie DLP. Benutzerhandbuch Ja. Betriebsanleitung Ja. Schnellstartübersicht Ja. Fernbedienung Ja. Höhe 34 mm. Tiefe 102,4 mm. Breite 165 mm. NEW Genuine, OEM DMD/DLP Chip for Vivitek DW884ST D8010W Qumi Q7 D803W-3D D857WT DW882ST Projectors. Genuine, OEM DMD/DLP Chip for Vivitek D865W D755WTi Qumi Q5 projectors. TeKswamp Warranty. Native HD 720p resolution with HD 1080p compatibility Bright 500 lumens and a 5, 000: 1 contrast Ratio for brilliantly vivid and detailed images Project a large and wide screen image up to 100'' (2.6 M) Diagonal Digital auto keystone correction with motorized focus for ease of operation Quad-core CPU at 1.5GHz on an Android V.4.42 operating system The QUMI Q3 Plus is an ultra-portable, HD pocket projector with Wi-Fi, Bluetooth, HDMI and Android OS. A show wherever you go with the built-in rechargeable battery. Home or office, the Q3 Plus offers entertainment enthusiasts and business travelers the ability to project HD video and data, anywhere, even on the go. Versatile and portable, the Vivitek Qumi Q6 is perfect for sharing digital content at work and play. Model:'Qumi Q6-GY. Native WXGA native resolution, HD 720p compatible resolution. Long life energy efficient LED light source with an expectancy 30,000 of operation. Versatile and portable, the Vivitek Qumi Q6 is perfect for sharing digital content at work and play. Item model number: Qumi Q6-GY. Native WXGA native resolution, HD 720p compatible resolution. Long life energy efficient LED light source with an expectancy 30,000 of operation. Genuine, OEM DMD/DLP Chip for Vivitek DW832 DW755WTIR Qumi Q6 DW3321 Qumi Q7 DW282ST Projectors. TeKswamp Warranty. The Qumi by Vivitek was among the first portable, LED-powered projectors capable of high definition and 3D display. The Vivitek Corporation has manufactured several different Qumi models, many of which can be found on eBay. Regardless of why you're looking for a portable projector, you can find a Qumi on eBay to fit your needs. What types of devices pair with the Vivitek Qumi? All of the projectors in the Qumi line pair with almost any digital devices you might have in your home or workplace. There are multiple ways to connect your Qumi to your other devices. Connectivity options include MHL, HDMI, Wi-Fi, USB, built-in memory, and the embedded media player on the Qumi Q6 for example. Smartphones - The Qumi pairs with Android phones as well as iOS. Tablets - Use your Qumi to project presentations or information from your tablet. Computers - Works with Apple and PC. Digital Cameras - Pair the Vivitek Qumi with your digital camera to share photos. Game Consoles - With the Qumi, you can project your games on the wall and play on a six-foot screen. How do you choose the right Vivitek Qumi? Vivitek has manufactured several models of the Qumi since they launched the mark in 2011. Each of the different Qumis has different features and advantages. All of them are small, lightweight, portable, and capable of jumbo projection sizes. Check out eBay for a selection of affordable Vivitek Qumi portable projectors and find one to fit your needs. If you're looking for something for home entertainment, the Q2 or Q4 might be good options. For more professional presentations and commercial purposes, the Qumi Q7 Plus or Q8 might be better. Qumi Q2 - 300 lumens, 720p projection. Weighs 1.1 pounds. Qumi Q3 and Q3 Plus - Operates at up to 500 lumens, 5,000:1 contrast ratio. Qumi Q4 - 1280 x 800 720p projection, 500 lumens. Qumi Q38 - Up to 600 lumens, 10,000:1 contrast ratio. Qumi Q5 - 500 lumens, 30,000:1 contrast ratio. Qumi Q6 - Up to 800 lumens, 30,000:1 contrast ratio. Weighs 1.04 pounds. Qumi Q7 and Q7 Plus - Up to 1,000 lumens of brightness, weighs just over 3 pounds. Qumi Q8 - Up to 1,000 lumens, 1080p full HD projection. Does the Vivitek Qumi projector support 1080p display? The different Vivitek Qumi models have different display definitions available. The Q38, Q6, and Q8 support high definition 1080p projection. The other models offer display resolutions of up to 720p. Content provided for informational purposes only. eBay is not affiliated with or endorsed by Vivitek.